Last night was the first time I was able to see Albert Pujols play baseball in person. He did not disappoint. In his first at-bat, Pujols blasted a solo home run to tie the game at two. He finished with a perfect night at the plate, going four-for-four with two runs batted in a 5-2 St. Louis Cardinals victory over the Milwaukee Brewers. Pujols scored two runs, one on a wild pitch in which he did not hesitate and sprinted home, and also played flawless defense at first base. He flashed the complete game he has worked so hard to hone, one that has made him the greatest player we will ever see. 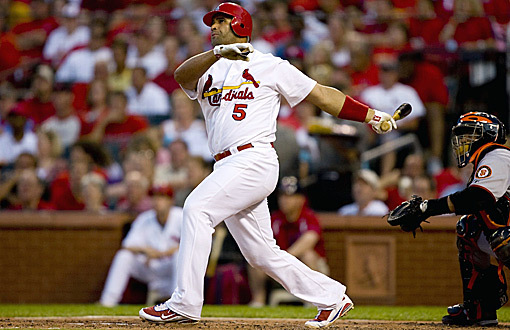 Albert Pujols seems to do everything well on the baseball diamond. He hits for average; Pujols has never hit lower than .312 in a full season and has five different years in which he batted at least .330. There is no one in the majors who is a more consistent power hitter; Pujols has 436 career home runs, topping at least 40 bombs in six different seasons. He is currently tied for the National League with 28 dingers. In the field, he is a two-time Gold Glove Award winner, despite not playing first base fulltime until 2004. He also provides versatility to the Cardinals, as he can play third base or the outfield in addition to a Gold-Glove-caliber first base. Pujols may not possess top-flight speed, but he is one of the best baserunners in the league. By scoring on a wild pitch yesterday, he demonstrated the perfect instincts of when to take off towards home. He always knows when he can or cannot take an extra-base on a hit because he always checks where the outfielders are positioned and how strong their arms are. With everything Pujols brings to St. Louis, there is no one who is a more steady force in every facet of the game than him. His finishes in the Most Valuable Player voting at the end of each season reflects that consistency. He is a three-time Most Valuable Player award winner. In his rookie year, he finished fourth in the MVP voting. Since then, he has finished outside the top three of the MVP voting just once in nine seasons, finishing second four times. Not surprisingly, a case could be made for Pujols to be the MVP in almost every season he has played in. His numbers are so consistent that what I might consider his best season, someone else might consider it his worst. There is almost no way to differentiate his .359/.439/.667, 51-double, 43-homer, 124-RBI, 137-run 2003 season (second in NL MVP voting) from his .357/.462/.653, 44-double, 37-homer, 116-RBI, 100-run 2008 year (MVP winner). Those seasons look similar to a .331/.431/.671, 33-double, 49-homer, 137-RBI, 119-run 2006 (second in MVP) and his 2009 season in which he won the NL MVP by batting .327/.443/.658 with 45 doubles, 47 home runs, 135 RBIs and 124 runs scored. 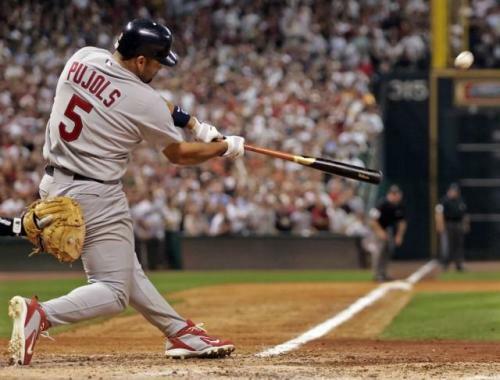 Pujols may have won the MVP in 2005 (.330/.430/.609, 38 doubles, 41 home runs, 117 RBIs, 129 runs scored), but his 2004 numbers (.331/.415/.657, 51 doubles, 46 home runs, 123 RBIs, 133 runs) and 2010 stats (.312/.414/.596, 39 doubles, 42 homers, 118 RBIs, 115 runs) are probably better, yet he finished third in the MVP balloting in 2004 and second in 2010. Pujols’ yearly statistics are almost interchangeable. His numbers are so consistent that it almost feels like voters decide they have to give the award to someone else because Pujols has no “best” season. He never surpasses his lofty standards, but he doesn’t underperform, either. He is just constantly great. Albert Pujols brings everything a baseball player can to a the diamond everyday. He is a terrific hitter who hits for both average and power. He plays a flawless first base but can also play other places in the field to help out his team. He is not fast, yet is possibly the best baserunner in baseball. Pujols has been so good for so long that his numbers each season are pretty much interchangeable. He has set the bar so high for himself that he has no “best” season. However, Pujols almost never fails to reach his standard for excellence. Only the greatest players in baseball history have been this consistent for this long. For our generation, Albert Pujols is the greatest player we will ever see. This entry was posted on August 13, 2011 by Scott Kornberg. It was filed under Albert Pujols, St. Louis Cardinals and was tagged with Albert Pujols, Cardinals, Gold Glove, MVP, Pujols, Scott Kornberg, Silver Slugger, St. Louis Cardinals.